Lesung is a Javanese word and it is called mortar in English. 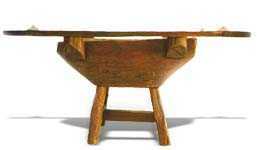 It is used for pounding rice for most of villagers in Java in years ago. It is made of whole hard wood that was shaped like a boat by carving it, so the beauty of it will be seen naturally. That ís what we do in our business, all furniture are handcrafted and it is performed by a skilled artisan and that ís why there is no two items are exactly alike. We produce them by using old fine teak wood. All sizes are approximate and may vary slightly. We donít use nails in any of our furniture or stringed instruments. Wooden nails and glue are more dominant used in making each item more durable, and our guarantee it will outlast your grandchildren. Just explore our website completely and you will find the distinguished furniture from us. Please feel free to contact us for further information.